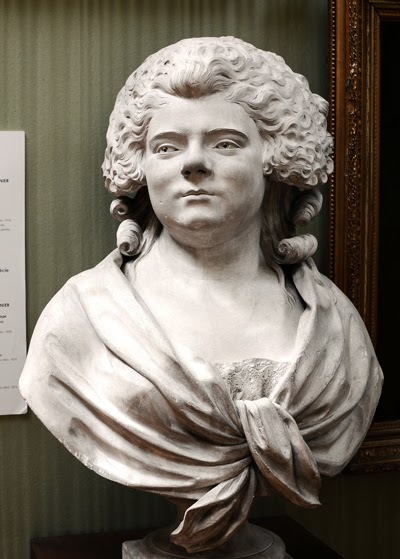 Claude-André Deseine, bust of Antoinette Gabrielle Charpentier Danton, plaste, 1793. Musée des Beaux-arts, Troyes. Plaster patiné, Musée de la Révolution française de Vizille. The death of Danton's first wife Gabrielle Charpentier and his extravagant reaction to it, is part of the myth of his emotion larger-than-life character. But what exactly happened? On reading the message, Danton let out a howl of pain that terrified those around him... He ordered his carriage at once and flew back to Paris over the rutted roads of Flanders and Picardy, his coachmen driven on by deep sobs coming from the shuttered cabin behind. It was not in Danton's nature to take his wife's death quietly. He had loved Gabrielle as a wife and mother, adored her; the idea that she could be lost to him, lost to his arms, was unbearable. The knowledge that he had abandoned her when she was weak and so close to giving birth increased his pain. And what for? For the Revolution, yes! But only to put out its distant fires. Not for what mattered most to him. The dash from Liege got him back to Paris on the evening of 16 February. He found his Cour du Commerce home under seals, a Cordelier magistrate's precaution against violation of the premises in the absence of both master and mistress. He had to wrestle with the door to enter. Gabrielle's body was not there. He learned from Camille, Lucile and Louise, who came down to be with him when they heard the noise, that she had been interred two days ago. Her father, old Charpentier, wished it so. A pair of Cordelier parish priests, now betrothed to the republic, had directed the coffin to their corner church for a blessing, and the Charpentier family, the Desmoulins, the Gélys and Gabrielle's two kitchen maids followed down the tight alley, past printers, bookbinders and Procope cooks fallen to their knees lamenting,"Oh Madame! Poor Madame!" Monsieur Charpentier had wanted her buried in the church, but there was no Danton family tomb at the Cordelier chapel and since random church burials had been forbidden for some years now, for the sake of public hygiene, Gabrielle was interred in the nearest public cemetery, situated in the Saint-Marcel district, the populous working-class ward neighbouring Danton's Théâtre-Français section. All this Danton listened to while blundering around his home, throwing himself from sofa to bedstead, his great chest jerking, hideous face contorted, as if still hoping to find his wife. He had to see her again. Church of St. Madeleine Troyes. His reactions were never less than outsize. His body, his face, his energy, his voice, his oratory, his temper, his heart, everything about him was outsized. His impulses overwhelmed him. Yes, he had to see Gabrielle once more. He had to keep her close. Through his tears, a solution formed: he would make a likeness of her, a bust he could for ever embrace and ask for forgiveness. The next evening he hurried to see a sculptor he knew, an artist with a workshop in the Saint-Marcel section. The sculptor shook his head. Madame Danton had been dead for a week, he reminded his frantic visitor, in her grave for three days past. A sculptor needed a mould to make a bust and how could he take the mould after she was buried? Danton implored him, thrusting a sheaf of assignats, the new paper money into his hand. The sculptor may not have been impressed by the paper money, which few Parisians believed in, but the bottomless depths of anguish on his visitor's ghastly face made him give way. Together - Danton in a dark cloak, the sculptor with his tools - the pair of them hurried that same evening to the public cemetery, banging on the gate for the keeper. A cold February rain greased the dark granite paths between the tombstones. The keeper came to the gate, waving them off, but yielded when he recognised the huge distressed face of the people's champion, the man the papers said was running the Revolution. The three of them were alone in the dark. By torchlight. they found Gabrielle's grave; only a foot of loose earth covered the coffin, for stonemasons had yet to get to work there. The warden held back. He had admitted the giant statesman simply to take a look at the grave. "A spade!" Danton roared. Within minutes they were at work, digging down to the coffin. Between the three of them they carried the muddied casket into the dry of a cemetery tool shed. At Danton's urging, the keeper searched for chisels to open the lid, a task that took half an hour of careful prising. As the lid came off and Gabrielle's waxen head showed in the flickering torchlight, Danton let out another terrible cry. With his huge fists he fumbled below the corpse and pulled his wife out, imploring her to forgive him, hugging her to him, squeezing her and kissing the stiff grey bloodless lips. With a groan he placed her tenderly on the displaced lid and motioned to the sculptor to do his work. This is a good tale, but it would be interesting to know how much is based on primary sources and how much is dramatic reconstruction. David Lawday's main reference is the biography by Louis Madelin published in 1914, which gives less detail but does indeed tell us that Danton forced opened the casket, embraced his wife, then had a sculptor - identified here as "his friend" Deseine - mould her features. The cemetery is identified elsewhere as the Cimetière Sainte-Catherine, which no longer exists. Deseine's sculpture, based on the deathmask he created, was exhibited in the 1793 Salon with the annotation "Portrait of Citoyenne Danton, exhumed and moulded seven days after her death"(See Madelin, p.217). The documents relating to the official placing of seals on the Danton's apartment in the Cour du Commerce on 12th February can be found in Robinet, Danton (1865), p. 206ff. The officials actually met the funeral cortege on the stairs. There must be more memoirs - maybe Lucile Desmoulin's, which I can't find on the internet. 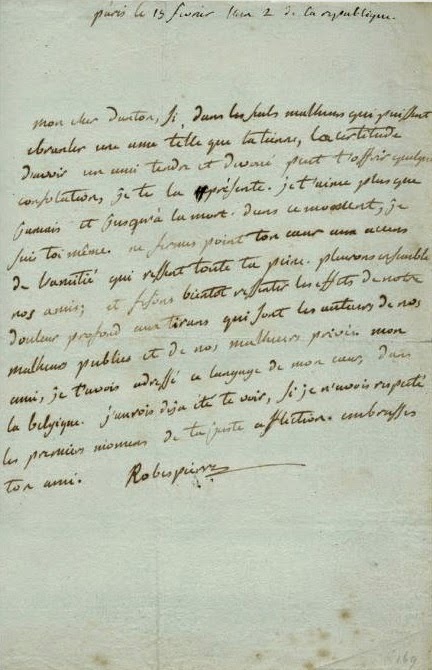 A web biography of Gabrielle's sister-in-law, the artist Marie-Constance Charpentier, reproduces a letter from François-Victor to his future wife describing Danton's state of mind when he finally arrived home to an empty apartment, and also his longing for a likeness of his wife. Georges arrived. He asked for his dear Gabrielle. He kissed the sheets in which she died. His only pleasure was to contemplate your sketch of her. He searched for her features and found them there. I talked to him but he did not reply. If you want to save him, if you want to save my family, call to mind the features of my adored sister, draw them, work on this alone. We ask this of you immediately. We will repay you with eternal gratitude and a tender attachment. Hearts such as ours cannot pay too highly for such a favour. 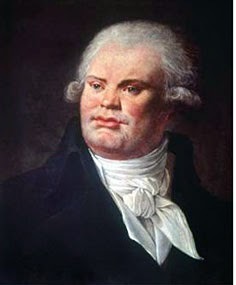 The original sketch and any further portraits by Constance Charpentier do not survive, though she created the best-known portrait of Danton himself, now in the Musée Carnavalet. In this sorrow that alone can break a heart such as yours, if the assurance that you have a tender and devoted friend offers any consolation, then I give it. I love you more than ever, until death. In this moment, I am you. Do not close your heart to an expression of friendship that feels all your pain. Let us weep for our friends and let our deep grief defeat the tyrants who are the cause of all our misfortunes, public and private. I would have come to see you except for the respect in which I hold your first moments of grief. Robinet, Danton: mémoire sur sa vie privée (1865), p.206ff. He had to love her so dearly!